throughout the entire state. Rapid response and eradication of these small infestations is critical to prevent the spread of this invasive weed. Russian knapweed produces 50 to 500 seeds from each shoot, which remain viable in the soil for 2 to 3 years (Ivanova 1966). However, the main method of spread for Russian knapweed is not by seed, but from adventitious buds on a creeping perennial root system. Roots have been observed to grow 6 to 8 feet deep in one season, and a single plant can expand radially up to 14 yards in two seasons (Frazier 1944). As infestations develop, they displace nearly all herbaceous resident vegetation, creating dense stands of Russian knapweed. A major reason for this plant�s competitiveness is believed to be from its ability to release allelopathic chemicals that inhibit growth of other plants (Renney and Dent 1958). These compounds have been found to hamper revegetation of previously infested land even after plants have been removed. Light disturbance of the soil surface has been shown to alleviate this problem (Bottoms & Whitson 1998). Prevention, early detection and eradication are the best management tools for Russian knapweed. Establishment and spread is rapid in abandoned agricultural fields and lots that are left unmanaged. This allows infestations to establish large, dense stands with large stores of carbohydrates in the root system. This stored energy allows plants to tolerate future management methods. 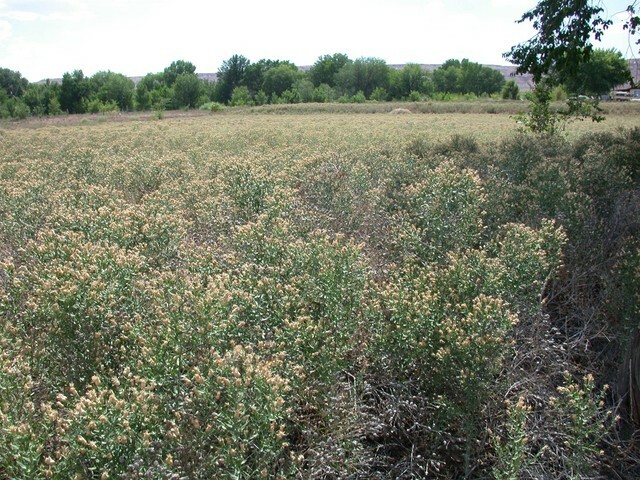 In contrast, small establishing infestations require fewer resources to eradicate and associated plants can rapidly recover from management methods, thus eliminating the need to restore the site. The best management plan incorporates multiple strategies including cultural, mechanical and herbicidal methods. A single control strategy, such as mowing or herbicide use, is not sufficient to control old, dense infestations (Beck 2003). knapweed forage has been demonstrated to be toxic to horses (Young et al. 1970a, b). 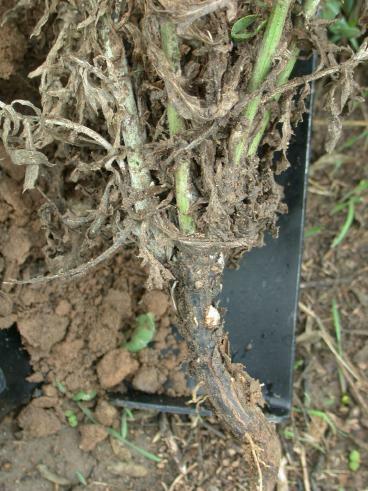 Disking or plowing infestations breaks roots into fragments that can survive desiccation and be deposited into uninfested areas, thereby increasing the infestation size. 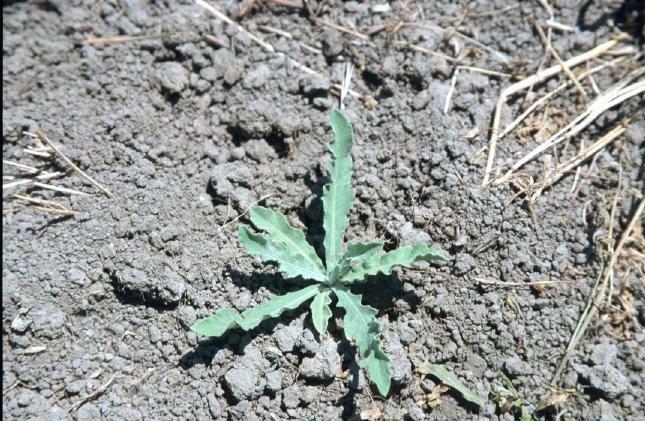 Select herbicide treatments can be effective for short-term management of Russian knapweed. Herbicide control of Russian knapweed can vary dramatically due to environmental variables, but several options are available that provide consistent short-term control (1-3 years) (Beck 2003). See table 1 for a list of herbicides available for management of Russian knapweed. It is important to read the herbicide label BEFORE making any application, as different herbicides will have different requirements and restrictions. Reclaim + 2,4-D*†‡ Clopyralid + 2,4-D 1.0 pts/A + 0.5 lbs ai/A Anytime plants are actively growing, best results in the fall before frost Residual herbicide. Transline‡ (or Reclaim) Clopyralid 0.67 - 1.33 pts/A Anytime plants are actively growing, best results in the fall before frost Residual herbicide. Plateau + methylated seed oil Imazapic + methylated seed oil 12 fl oz/A + 1 qt/A Late fall after frost Residual herbicide. Arsenal‡ Imazapyr 2 pts/A Anytime plants are actively growing, best results in the fall after frost Residual herbicide. Many compounds*‡ Glyphosate* 3 - 4 lbs ae/A Flowerbud stage Poor control can result some years. This is the California Department of Food and Agriculture factsheet on this weed. Element Stewardship Abstracts (ESAs) are prepared to provide the Nature Conservancy�s Stewardship staff and other land managers with up-to-date management related information on species and communities that are most important to protect, or to control. The abstracts organize and summarize data from many sources including literature and researchers and managers actively working with the species or community. From North Dakota State University. This is the University of Nevada Cooperative Extension's document on managing Russian Knapweed. 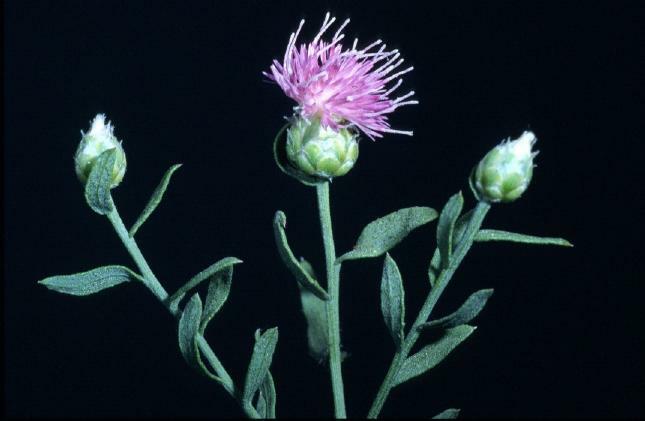 Russian knapweed and other similar weeds are discussed in this circular from Montana State University. This is Colorado State University Cooperate Extension's document on Russian Knapweed. Another Colorado State University document on Russian knapweed. Bottoms, R. M. and T. D. Whitson. 1998. A systems approach for the management of Russian knapweed (Centaurea repens). Weed Tech., 12:363-6. Frazier, J. C. 1944. Nature and rate of development of root system of Centaurea picris. Bot. Gaz. 105:345-51. Ivanova, T. S. 1966. Biological control of mountain bluet (Acroptilon picris C.A.M.) (In Russian) Azv. Acad. Nauk. Tadzhik. SSR. (Otel Biol. Nauk.) 2:51-63. [translation- Translation Bureau, Can. Dep. Secretary of State, No 3793]. Rees, N. M., P. C. Quimby, G. L. Piper, E. M. Coombs. C. E. Turner, N. R. Spencer, and L. V. Knutson (eds.). 1996. Biological control of weeds in the west. West. Soc. Weed Sci. Renney, A.J. and W. J. Dent. 1958. Growth inhibition caused by Russian knapweed (Centaurea repens L.). Res. Rep. Natl. Weed Comm. West. Sec., 122-23. Whitson, T. D., (ed.). 1996. Weeds of the West. 5th edition. West. Soc. Weed Sci. 92- 93. Young, S., W. W. Brown, and B Klinger. 1970a. 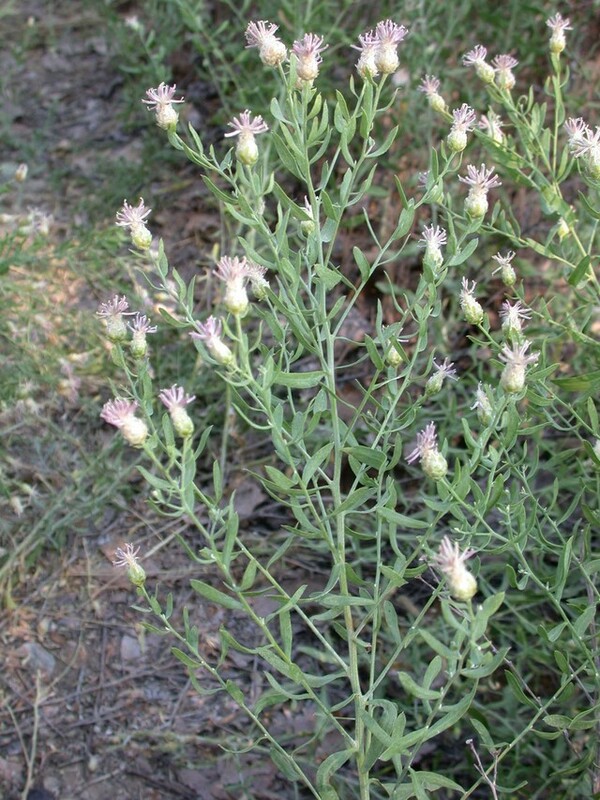 Nigropallidal encephalomalacia in horses fed Russian knapweed (Centaurea repens L.). Amer. J. Vet. Res. 31:1393-404. Young, S., W. W. Brown, and B Klinger. 1970b. Nigropallidal encephalomalacia in horses fed Russian knapweed (Centaurea repens L.). Amer. J. Vet. Res. 1157:1602-05.